sip. savor. taste. linger. inhale. munch. chomp. bite. devour. slurp. tantalize. tempt. feast. nibble. indulge. infuse. inspire. a friend recently asked me why i incessantly post instagrams of all my eating exploits. from burgers and brie fries to tortellini and truffles, i’m constantly snapping, filtering, tagging and posting. i realize this may be annoying…and if it truly bugs you, you’ve probably already hidden my culinary captures from your feed. or perhaps the constant deluge of edible delights may make you hungry. you might have just eaten a perfectly respectable sandwich, and then along comes a pic of a ginormous piece of carrot cake, moist yet flaky, three layers deep, heaping with cream cheese frosting and homemade whipped cream, dusted with a hint of cinnamon, and BOOM, the grumbellies kick right back in…and maybe, just maybe a droplet of drool falls from your lips. if that’s the case, i’m truly sorry. food is meant to be shared, but the virtual method doesn’t quite give you the warm afterglow and full-bellied feeling of an IRL (“in real life”) bite! so what is the psychology behind this obsession? as a child i was never lacking in the food department so, as far as i know, there’s no deep-seated void that’s being filled by the endless food photo frenzy. but there must be a reason i get so lathered up. if you’re passonate about food, you know that it’s not just nourishment. it’s creativity. history. beauty. emotion. feelings. flavor. memory. harmony. sustenance. whimsy. comfort. togetherness. to you, it may just be a piece of bread. to me, food is life. meant to be savored, celebrated and devoured…especially with a sunny side up egg on top. CHOMP! i found out about the festival from a popular creative magazine that i follow called contagious. they were running a contest: describe your perfect picnic in 10 words or less, and you could win a ticket to the 3-day extravaganza, which showcases international luminaries from the worlds of design, advertising and academia. from a practical standpoint, i wasn’t serious about entering because, even if i did win, i couldn’t justify hauling myself across the pond and paying for airfare and lodging, just to soak up the “inspiring ideas”…but the writer in me was excited by the challenge. the first thought that popped into my head was the food! (shocker, i know.) a crusty baguette. a crisp sauvignon blanc. italian salami and artisan cheese. tuscan white beans marinated in extra virgin olive oil. bubbly san pellegrino. and for dessert, a big flakey mille feuille oozing with rich creamy custard with each delectable bite. the food is lovely…but i come to realize “picnic” is a state of mind. a feeling. it’s simplicity. sweetness. sharing. whimsy. imagination. an invitation. an escape…yet utterly familiar. now i hear norah jones crooning in my ear. my perfect picnic in 10 words or less. naked toes. green grass. cloud shapes. deep breaths. belly laughs. for italians, it’s pasta sauce. for jews, it’s matzo ball. for southerners and sports fans, it’s chili. and for filipinos, it’s sinagang (pronounced “sin-ee-gung”), a sour tamarind-based soup that is the country’s quintessential comfort food. what is it about these dishes, cooked in a pot, bubbling on the stovetop, that makes us swoon? why, when we bite into them, do we experience so much more than mere flavors and textures, but also warmth, togetherness, security, sustenance—the visceral, irresistible taste of home? recently i went on a trip to LA to visit family. much like the midwest, they’ve been going through a nasty heat wave, and our first few days there were scorchers. to deal with the blistering temperatures, we consumed lots of salads, fresh fruit, coconut water, pinkberry, and more than a few glasses of sauvignon blanc. yet when my parents arrived, the culinary conversation took a 180 degree turn. they gathered their luggage from the car, flung open the door, and my son, bursting with anticipation, ran to my dad. he stretched out his arms and squeezed. there, in the 110-degree, sweat-inducing oven that was the san fernando valley, my son was begging for a bowl of hot soup. you might think it cruel that the poor guy, now in his 70s, flew 4.5 hours to get here to be with his family, only to be told he had to step on over to the kitchen to start cooking…but you’d be wrong. dad is “the man” in the kitchen and there is no place he’d rather be than with his family stirring up a big piping pot of sinigang. it’s a “kitchen-sink” kind of soup, chock full of ingredients and simple to prepare; yet for some reason it never quite tastes the same as when dad makes it. he starts by trimming the meat—usually short ribs but sometimes oxtail or chuck. then he slices the vegetables: chinese eggplant, broccoli, cabbage, green beans, okra, parsnips and a bit of ginger. he throws it all into the pot (the biggest one he can find) and sprinkles in the knorr sinigang seasoning, which gives it a delicious sour flavor similar to thai tom yum soup. for more nuance (and also to preserve his status as the best sinigang maker in our family), he always throws in a couple extra mystery ingredients at the end when we’re not looking: a squeeze of calamansi, filipino lime, to infuse a hint of acidity, a dash of patis (fish sauce) for a bit more saltiness. he brings it all to a boil, occasionally lifting up the lid to make sure every veggie and piece of meat soaks up the flavor. delicious steam rises into the air. and then he drops it down to a simmer. flavors are extracted. aromas start to permeate. we all breathe in deeply…love is in the air. we love it. and we love him. and all of that love goes straight into the pot…and down into our bellies. we sit together at the table, and for a rare few minutes in our boisterous household, it’s quiet—save for the clinking of spoons and forks as we shovel in the “sabaw” or broth-soaked rice and fight for the last pieces of broccoli. the table inevitably erupts into giggles when my brother, as he has been doing since we were little kids, gets up for a third plate of rice and scrapes the bottom of the pot for any remaining morsels. no matter what it’s called, this kind of meal is so much more than food—it’s love in a pot. it’s rituals passed on from generation to generation. like chicken soup for the soul, it’s healing. it’s warmth. it’s sustenance. it’s comfort and connectedness. it’s your history. your family. it’s home. one of my biggest sources of inspiration these days is our weekly family trips to the green city market, a farmers market near the lakefront in chicago. we walk, hand in hand, admiring the vibrant produce that heralds each season, chatting with the friendly local farmers, and sampling tasty bites from eco-minded entrepreneurs selling everything from artisan cheeses to piping hot cider cinnamon donut holes, grass-fed burgers with butterkase cheese, homemade rosemary honey ice cream, decadent crepes and smoking hot tamales. here in this giant city of nearly 3 million, people actually smile at each other as they pass by. tails wag in unison as dogs of all shapes and sizes exchange curious sniffs and playful barks. tempting aromas waft, blooms burst with color, and kids beam with sticky fingers and berry stained lips. besides the delicious ritual of it all, i've come to appreciate so much more about this weekly trek than i ever realized when we first started going to the market several years ago. i guess you could say i've been on a journey…and in the process, i've realized that the market is not simply about a place to hang out on a saturday morning as the city starts to stir. it's about a lifestyle, a change of mindset, an idea, and a movement that you can actually believe in. in the past, there have always been certain things about food or politics or the environment that have bugged me, but generally speaking, life was good and i never felt like i had the time nor the inclination to dwell too long on these massive issues. it's not that i didn't care--i simply felt overwhelmed. sadly, i felt pretty darned accomplished if my day included waking up to the alarm (without hitting snooze), figuring out what to wear, getting the kids ready for school, orchestrating my days filled with work, deciding what to make for dinner, squeezing in errands and whatever me-time i could muster. as a working mom with two kids, that's about all the head space i had left. but the little drips of exposure to news headlines and to friends and family dealing with health issues started to chip away at my complacency. when i finally watched "food inc.," everything came to a head. i was at a tipping point. why is the food we eat--especially fast food--so cheap? how is it possible that all the bright shiny products in the grocery aisles: the flawless fruits, plump chickens, perfect pork chops, don't make us stronger and healthier, but rather bafflingly sicker? how, with modern science and technology, are we seeing new strains and countless epidemics of e. coli—the harmful bacteria that causes illness for an estimated 73,000 Americans annually. why do more and more people we know, and worst of all kids, suffer from cancer and diabetes, rampant allergies, ADHD, autism and obesity? until food inc., i never realized how little control we as consumers have when it comes to our food, how unregulated the industry is, how little choice we actually have--despite the aisles and aisles of products that line the shelves. on this journey, my personal journey, this movie pushed me over the edge. all this depressing news could lead one to feel even more overwhelmed than ever before. but rather than close my eyes, stick my head in the sand, i actually felt empowered. to make a change. the one choice we all have is this: we can make smarter, more informed choices. 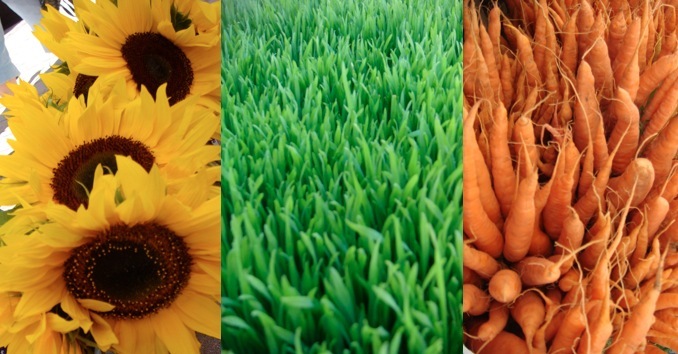 we can seek out the freshest ingredients at our local farmers market. we can make little changes that have a huge impact on our health and well-being, starting by simply being aware. for the longest time, there were a lot of buzzwords that were an enigma to me. organic, sustainable--it all seemed like clever marketing, an excuse to charge a premium at "whole paycheck" (aka whole foods) without a clear benefit. "sure it might taste a little bit better," i rationalized, "but i don't mind the occasional bruise on my apple or tough piece of meat. it's worth it for the cost savings." but what i didn't realize is that what i was supposedly saving in terms of dollars up front, was costing me and my family in the form of health risks later---from pesticides on produce to steroids given to sickly livestock to cancer-causing, genetically modified crops. sound extreme? to that, i'd say watch the film and decide for yourself. and if you're still not convinced, i would only ask this: if there were even a remote possibility that any of these things were linked to health issues, and you actually had the power to do something--to avoid them--wouldn't it be worth it to try? especially if it were much easier than you ever thought? on this journey, i came to find out that the words bandied about actually have critical meaning. why organic? simply put, organic means no pesticides, no chemical fertilizers, no genetically modified organisms, no irradiation, no industrial solvents and no chemical additives. why local? locally grown fruits and vegetables are usually sold within 24 hours of being harvested, versus weeks or months like the ones at the grocery store. produce that is in season and picked at the height of ripeness has exceptional flavor and the most nutrients. finally rather than lining the pockets of mega-corporations, who aim for the cheapest (aka poorest quality) food and build in costs for packaging, preserving and shipping your food, you're directly supporting the little guy--small farmers who bring food to our tables with passion and integrity, rather than simply for profit. why sustainable? "to sustain" means "to keep in existence"--for ourselves, for our children and for future generations. sustainable farming is a way of raising food that is healthy for consumers and animals, does not harm the environment, is humane for workers, respects animals, provides a fair wage to the farmer, and supports and enhances rural communities. it's about rotating crops to preserve nutrients in the soil, not using toxic pesticides, serving as stewards rather than solely acting in self-interest. do i still eat out at restaurants, have an occasional cocktail or three, snarf up a double char dog at the wiener's circle, or take a trip to the vending machine for a reese's peanut butter cup when the craving hits? sure. i'm hardly ready to swap out the blahniks for a pair of birkenstocks. but, at the very least, most of the time, i eat in a way that makes me feel good, inside and out. and that feels right: physically, emotionally and ethically...there are few other things i can think of in this crazy world that fit that bill. “in wine there is the truth.” it’s a latin phrase that refers to the remarkable ability of wine to bring out people’s true feelings. we’ve all been there before: several glasses in, feeling a warm glow, inhibitions wiped away…and the truth comes out—sometimes for the good, other times…well…you might just hope that the truth serum comes with a memory-eraser so you don’t have to relive the silly, embarrassing or awkward moments of truth spurred on by the multiple glasses of liquid courage you just consumed. i’m sure about now you’re anxiously awaiting the sordid details of a wine-induced night filled with squirmy truthful confrontations or swinging from chandeliers…but alas, i must disappoint. this time i’m taking the high road, telling a wine tale of a different kind: about the “noble grape” and the truth it can teach us about ourselves. several years ago, we went on a trip to napa valley. if you’ve never been there, it’s time to add it to your bucket list. it’s mind-blowingly beautiful with acre after acre of lush vineyards, the freshest, most vibrant produce you’ll ever eat, and rich napa stories of the people behind each unique winery. we had been there several times so rather than the casual meandering of our previous trips, this time we had an actual agenda. the wine spectator ratings were logged, the route was mapped out, and our mission was to check out some of the best california cabernet wineries in the region. for such a little valley (30 miles long), there are more than 45,000 acres planted to grapes in napa. we wanted to find out what made these wines some of the very best—not only in california, but the world. we started out at rudd, a jawdropping estate in oakville. it was regal and elegant, with amazing gardens, a tuscan style tasting room and an intriguing ivy-covered hobbit hole that served as the entrance to their wine cave. past the massive sunflowers beckoning you in through the doorway, it was what you’d expect: beauty, refinement, a perfectly manicured epicurean experience. next we hopped down the road to groth, where it was much more about education than elegance. though the property was pretty, it was here that we received a much deeper glimpse into the art and science of winemaking: the winemaker’s philosophy, the process, and the vast array of factors that go into making world-class wines. we took a tour and got up close and personal with a critical component of the winemaking process: the soil. mason jars filled with gravely dirt samples lined the shelves of one room. and when we walked through the dusty vineyard, the ground felt not lush and fertile as we had expected, but dry and in some places, rock solid. we came to find out that over 2 million years ago, “the beautiful and serene napa valley was one of the most violent places on earth” from a geological perspective. “the ground on which we were standing was created by exploding volcanoes and fiery flows of molten rock, shattering earthquakes, upthrust chunks of primeval sea bottom and massive floods”—yielding some of the most mineral-rich soil for grape-growing. in the oakville appellation, the 1.5 mile stretch where these two wineries sit, the poor, nutrient-deficient top layer of soil causes the vines’ roots to strike deeply into the earth in search of nutrition. at these depths, they are able to find enough moisture to sustain themselves. making the twisty, twenty-minute trek up to pride mountain, a similar theme emerged. 2000+ feet up, the winemakers talked of rocky, volcanic soil, excellent for drainage and creating the perfect conditions to “stress the vines.” the dry soil forces the vines to push deeper to find sustenance. the end result is smaller, more compact grapes with higher skin to juice ratio—ultimately developing the complex and concentrated richness of these wines. from gentle stress comes succulent flavors of black cherry, currant, blackberry, cassis, licorice, cocoa and even vanilla. i loved the idea of such richness coming from rough circumstances. the tumultuous story of the soil yielding some of the most coveted treasures in the wine world. too much of a good thing (in this case water) leads to big, full grapes that lack depth and dimension. too little means poor grapes that fail to grow. the delicate balance of stress and diligent care yields the very best results. the truths i found, in winemaking as in life: out of stress, comes character and complexity. out of hardship, resilience. out of the need to survive, you can actually thrive. not everyday can be a revelation. where you experience a life-altering epiphany. a defining milestone. a brush with death. or unexpected kindness. sometimes—most of the time—it’s just plain ordinary. status quo. wake up. slog through the day. clock it at 5pm. make dinner. put the kids down. take the dog out. pass out. lather. rinse. repeat. like “fred the baker” in these classic dunkin donuts commercials, it sometimes feels like we’re shutting off and going rote. autopilot. same thing, different day. when i get that feeling, i turn to one of my best, most reliable friends: chocolate. what is better with chocolate, you ask? well, everything, of course. if you’re having a bad day, chocolate is a scientifically proven pick me up. if it’s a special occasion, chocolate says “i love you”—did you know consumers buy more than 58 million pounds of chocolate during valentine’s week? for your kid’s first ice cream cone, tell me it wasn’t chocolate? have family in town: then the go-to pan of classic chocolate brownies never disappoints. a favorite decadent dessert: melty lava cake oozing with chocolate goodness. 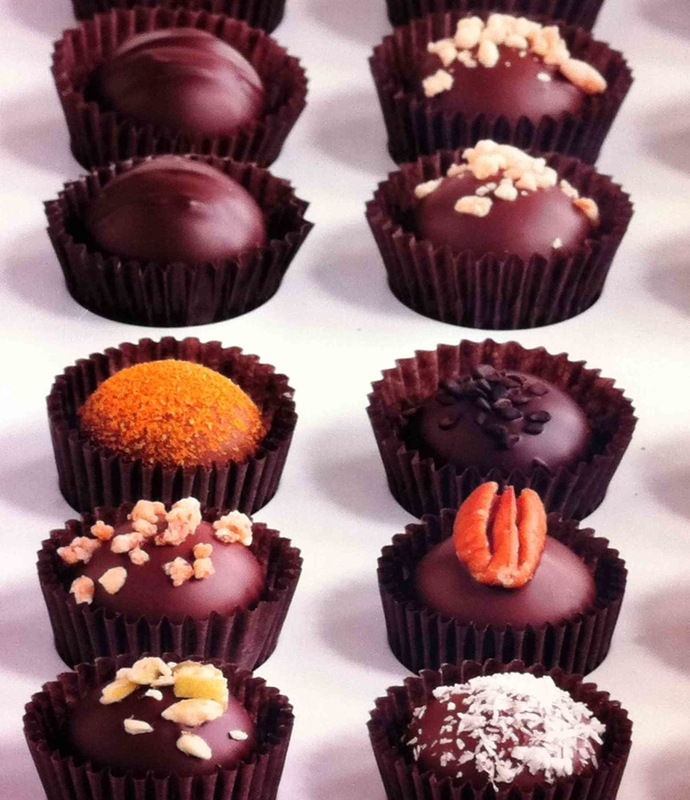 “take me away”: when i really want to splurge, i spring for a $26 box of exotic truffles from vosges, an haut chocolatier in chicago. wrapped in a gorgeous purple box and satin bow that puts even the iconic robin’s egg blue tiffany box to shame, this collection of truffles aims to transcend with tastes of exotic lands and indigenous cultures. chocolate paired with curry, wasabi, macademia nuts, cointreau, paprika and crunchy hazelnut praline is served up with whimsical names like gianduia, ambrosia, absinthe, naga, black pearl, budapest, woolloomooloo and my favorite, wink of the rabbit. “a nugget of goodness”: if you’re not buying the opulent spin and yuppified version of this delicious treat, then do as i do most days: kiss—keep it simple stupid. chocolate, nearly any kind of chocolate, can do the trick. it doesn’t have to be fancy to be fabulous. i often keep a little stash of hershey’s kisses in my purse. when the going gets tough, the chocolate gets going: out of my bag and straight into my mouth. it’s not about gorging and then feeling guilty later. rather, just a little taste, a nugget of goodness in an otherwise blah day. that simple. that delicious. there's a phenomenon in my office that can only be described as "bacon lust." whenever the word is mentioned, people swoon. groans of delight can be heard throughout the halls. one of our most popular potluck events is "bacon fest," in which people share their most beloved, creative bacon dishes, which range from carmelized bacon rumaki to maple bacon ice cream. we've recognized stellar employees by signing them up for the "bacon of the month" club. when we have friday morning breakfast, you better be early or the only thing left will be an empty tray full of bacon drippings. ever wonder what it is about bacon that induces such hysteria? obviously there's the taste. that crisp, salty, fatty goodness is the starting point. but i believe there's so much more. the smell, that can transport you from your office drudgery to sunday morning brunch with your family. to hefty BLTs that you've shared with your buddies. it fills your belly and warms your heart. the bacon lust that i and my co-workers share reminds me of one of my favorite chefs and writers, anthony bourdain. he's jaded, he's cynical. he's opinionated. he looks like one of those dudes that, after a night of slamming tequila shots with his chef-lebrity friends into the wee hours, wakes up to smoke a ciggie and down a cup of black coffee just perfect the raspy horse lodged firmly in his throat. and he happens to love swine. despite his sometimes crass demeanor, you can tell the man loves food. whether it's "whole roasted piggy" in the barrios or french fare at le bernardin, you can feel the love oozing from every pore. it's visceral. if you've ever seen him eat bone marrow, you know what i'm talking about. he closes his eyes. he savors it. his eyes roll back into his head. and after he's through, he takes a big exhale and probably reaches over to light another ciggie! i can relate. people always ask me why i always take pictures of my food. why i takes me so long to finish. why i feel the need to post vivid descriptions of every meal on facebook (as if to not post each ingredient means it doesn't exist). the answer is simple. it's simply because i love food. i may have been known to utter the phrase "i love it so much i'd marry it" about a plate of truffle fries once...and you know what? i meant it :P ...so when i came across a writing contest that anthony bourdain was sponsoring called "the medium raw challenge," i bit. the assignment is simple. write an essay answering the question: "what does it mean to cook food well?" the prize: your write up being featured as a forward in the paperback edition of bourdain's new book, "medium raw". here is my essay entry, reproduced here. i guess you could also call it a manifesto about why i love food. Six concise lines. A world of meaning. What chefs know, and people who are passionate about food feel intuitively, is that "cooking food well" all comes down to one thing: respect. For the ingredients. For the artistry. And yes, for the taste—that lingers far beyond the moment when morsel touches mouth. The ingredients: Respecting the pig in all its "piggy-ness"
In this age of mc-mass production, over-processed, genetically modified, artificially sweetened slop that is passed off as food, "cooking food well" means buying from farmers who care for their animals and crops like they do their own children. Using every part of the pig to show the little fellow that, in life as in death, he maintained his dignity, served a higher purpose. Choosing ingredients that are fresh, local, seasonal. Why? There are a plethora of reasons, from nutritional to sustainable, even metaphysical, but the one true defense, in the context of cooking and eating "well" is that it simply tastes better. Whether you're talking about a swine or sweet peas, heffers or jicama, respecting the ingredients means celebrating them in their purest form. My respect for and fascination with cooking lies in its power of transformation. It has nothing to do with formal training, CIA-certified technique, James Beard accolades. No, this is about the ability to turn the simplest of ingredients—eggs, bread, cheese—into life-altering experiences. It's about the mastery of chefs who can turn piles of produce into painstaking masterpieces, course by delectable course. Whether you rigidly follow recipes or embrace improvisation, whether it's home cooking or haute cuisine, the foundation of "cooking well" is passion—deep, burning passion—to create (and ultimately eat) a delicious meal. A great meal has the power to transcend time and space, simply through its taste. When you experience it, the flavors linger. The taste is imprinted, seared, into your mouth, your nose, your brain, your soul. It lingers. "Cooking well" is about understanding that food doesn't just exist to provide fuel, satiate your appetite or satisfy hunger. It's about something much deeper. It nourishes your spirit. Deepens bonds. Connects you to loved ones. Fills the void. Turns that frown upside down. It gives you a taste of life. Offers a glimpse of truth. "Cooking well" fuels living well. Food for your body and your soul. do you ever feel like the universe is conspiring against you? like a black cloud is hovering overhead, following you closer than your own shadow? times when everything seems to go wrong in a crazy succession of circumstances that conjures up images of the old "mousetrap" game—a chain reaction of events that ends up with you, trapped under a web of just plain bad luck? when i go through those agonizing stretches, i find that rituals help to keep me grounded. take brunch, for example. brunch at bongo room happens to be one of my favorite rituals. our usual order: eggs benedict for me, breakfast burrito for my husband, and a "chocolate tower" to split (that's right, dessert with brunch). the decadent tower is made of bittersweet chocolate chunk bread stuffed with maple mascarpone, banana creme brulee sauce, bananas and shaved chocolate. that in itself is the stuff of breakfast legends. but there's so much more to the bongo ritual than just the delectable food. when we go there, it's friendly and familiar. a neighborhood joint where you can feel the energy of the city, but where they also know your name (i know, queue up the "cheers" theme song). people-watching is a wholly satisfying event: a mix of urban hipsters, post-college grads with their visiting parents, tatooed rockers, urban moms and dads with bugaboo strollers parked outside and new couples, sometimes formed a few hours earlier and sharing their first sober conversation—all while a faint yet thumping soundtrack worthy of boys town plays in the background. the feast for the stomach, the eyes and the ears is topped off with a leisurely stroll around our beloved hood. rituals are so special because they're like coming home: when your world is in flux, they provide comfort, safety, the feeling that "everything is in its right place"...and in the case of bongo, rituals can often happen to be delicious too. rituals can come in all shapes, sizes and circumstances. at face value they seem almost trivial—but if you look a little deeper, they're usually far more than simple acts that satisfy a craving or entertain you while you're killing time. unlike most things in life, rituals are a tiny sliver of life that you can control—and make your own. what are the rituals that you hold dear, that help you make order out of the chaos of daily life? i'd love to hear them, and maybe add a few more to my own playlist.